Madagascar, an island nation off East Africa, has seen waves of settlers from southeast Asia, Africa and Arabia for at least possibly the past 2000 years, with many groups settling and some establishing trade posts. The population today is mostly Malagasy. Different groups of Malagasy people coexisted until the Merina people consolidated made it into a single kingdom in the 19th century. Many French settlers arrived in this period. The monarchy ended in 1897 when the island was fully colonised by France, from which it became independent in 1960. Since independence, Madagascar has seen many constitutional changes, most recently a coup in 2009, and new democratic elections in 2013. The economy was historically dependent on agriculture, mainly rice and plantation crops, including spices. State nationalisation of many industries in the 1970s was followed by falling industrial production and exports and increasing debt, which led to widespread economic restructuring in the 1980s. Today, agriculture contributes some 30% and manufacturing 15% of GDP. Other important sectors are tourism and some mineral mining, albeit in early stages. Balancing the needs of conservation (including relating to tourism) with traditionally dominant agriculture and with increased mining is an ongoing issue. In addition, tourism is vulnerable to political instability that is still evident. Hydroelectricity is an important source of power, but has not yet been fully exploited. Groundwater is of great economic and social importance in Madagascar. Groundwater is a major source of public supply, with several towns entirely reliant on groundwater, and is the only available water source in the semi-arid south and other dry areas. 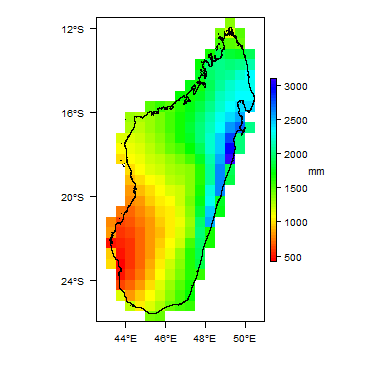 It is difficult to find good, reliable data on the hydrogeology of Madagascar. Even if they exist, groundwater data are often hard to access from the organisations that hold the data, such as government, international organisations, NGOs, and drilling and engineering companies. Please cite this page as: Upton, Ó Dochartaigh, Monteleone and Bellwood-Howard, 2018. Border countries none - Indian Ocean. Madagascar has an area of 592,000 km2, stretches 1600 km from north to south, and has a maximum width of 600 km from west to east. It lies 300 km east of the east African coast, in the intertropical zone. A highland area, which covers two-thirds of Madagascar, formed by Precambrian basement rocks. This landscape has rounded hills separated by plains, with river valleys. The highest part is the Tsaratanana massif, which reaches 2,876 m, and the highlands have an average altitude of 2000 m.
Lowland sedimentary basins around the coasts, which cover one third of the country. The west coast of Madagascar is dominated by mangroves and swamps; the southwest and extreme south by sand dunes; and the east by sandy beaches. Madagascar. Map developed from USGS GTOPOPO30; GADM global administrative areas; and UN Revision of World Urbanization Prospects. For more information on the map development and datasets see the geography resource page. 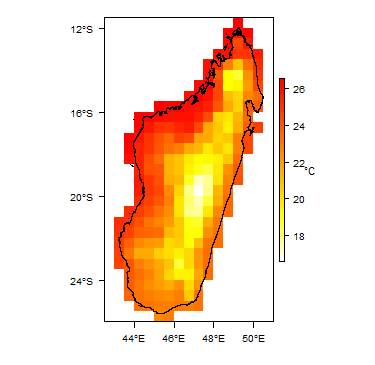 There are different climate zones across Madagascar. Rainfall and temperature vary across the different zones depending on altitude and location relative to the coast and prevailing winds/monsoon rains. The highest rainfall is along the northeast coast, where annual rainfall can exceed 3000 mm. The lowest rainfall is in the southwest, which is semi arid, with less than 400 mm rainfall annually. There are two distinct seasons: a cool, dry season from May to October, dominated by trade winds from the southeast, during which only the east coast receives any significant rain; and a hot, rainy season from November to April, dominated by the northwest monsoon (Rakotondrainibe 2006). 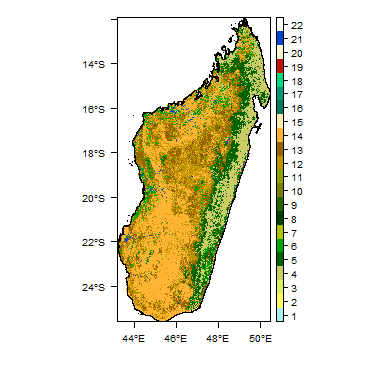 More information on average rainfall and temperature for each of the climate zones in Madagascar can be seen at the Madagascar climate page. The rivers of Madagascar rise in the Highlands and flow towards the coast, dominantly to the west, south and east. There are few rivers in the north (Rakotondrainibe 2006). The rivers flowing west carry large amounts of sediment, draining across muddy plains and mangrove swamps into the Mozambique Channel. The rivers flowing east are generally short, but can have high flows. The rivers flowing south are typically ephemeral, or ‘wadis’ – dry in the dry season, flowing only after heavy rains (Rakotondrainibe 2006). There are many lakes, including: Alaotra, Itasy and Andraikiba lakes in the Highlands; Kinkony, Hima, Ihotry and Tsimanampatsotsa lakes in the west, and the salt lake of Ihode in the south (Rakotondrainibe 2006). Major surface water features of Madagascar. Map developed from World Wildlife Fund HydroSHEDS; Digital Chart of the World drainage; and FAO Inland Water Bodies. For more information on the map development and datasets see the surface water resource page. Soil Map of Madagascar, from the European Commission Joint Research Centre: European Soil Portal. For more information on the map see the soil resource page. Land cover is dominated by pasture and woodland, each covering around 40% of the land area. The dominant arable crops as coffee, vanilla, sugar cane, cocoa, rice and cassava (BGS 2002). Land Cover Map of Madagascar, from the European Space Agency GlobCover 2.3, 2009. For more information on the map see the land cover resource page. This section provides an overview of the geology of Madagascar. The geology map on this page shows a simplified version of the geology at a national scale (see the Geology resource page for more details). A higher resolution geological map of Madagascar is the Carte géologique de Madagascar, echelle 1:1,000,000. Scanned versions of this map in 3 tiles are available at the Bibliothèque et Archives Universitaires Cartotheque: Feuille du Nord, Feuille du Centre et Feuille du Sud. More detailed information on the geology of Madagascar, with particular relevance to hydrogeology, is available in the following reports: UN (1989); Rakotondrainibe (2006) and BRGM (1968). Geology of Madagascar at 1:5 million scale. Based on map described by Persits et al. 2002/Furon and Lombard 1964. For more information on the map development and datasets see the geology resource page. All of the Highlands areas of Madagascar – about two-thirds of the total country area – is underlain by ancient Precambrian metamorphic rocks, also called crystalline basement. The remaining third of the country – the coastal lowlands and valleys – is underlain by younger sedimentary and some volcanic rocks, from Carboniferous to Quaternary in age. The geological sequence of these four basins and of the central Highlands area is summarised in the table below. This information is based reports by Rakotondrainibe (2006) and UN (1988). Tertiary Eocene limestones with areas where there are some calcareous dolomite, marl, calcareous marl and marly limestones. Local outcrops of Oligocene marls. Neogene continental soft sandstone with sandy clay crops out across the coastal region, with a cover of sandy shells. Cretaceous Upper Cretaceous – sandstones (sometimes clayey); marl; limestone (sometimes chalky). Middle Cretaceous – sandstones (sometimes glauconitic); marl; limestone; clays. Lower Cretaceous – marls and clays; sandstone (sometimes glauconitic); limestone. Jurassic (Middle to Upper) Upper Jurassic – limestones (sometimes marly); sandstones (sometimes glauconitic); marls. Middle Jurassic – marine karstic limestones forming large plateaus, e.g. at Ankara and Kelifely of Bemahara. Karoo system (Upper Carboniferous – Middle Jurassic) Isalo Group (Triassic to Middle Jurassic) – continental sandstones (often poorly cemented and conglomeratic), with marine intercalations of marl and limestone. In total these are several thousand metres thick. Sakamena (Permian) – largely continental but with marine intercalations, comprising micaceous sandstones, shales and clays. Sakoa (Upper Carboniferous) – found only in the southwest. Comprises tillites, black shales, coaliferous sandstone, clay and minor limestones. Neogene marine sequence of alternating limestones, sandstones and basaltic tuff, covered by basaltic flows. Cretaceous Upper Cretaceous – sandstones(sometimes with calcareous beds); marly chalk. Middle Cretaceous – mainly marls (sometimes with gypsum). Lower Cretaceous – marls; clays; continental sandstones. There are also some Upper Cretaceous volcanic basalts. Precambrian A mixed complex of metamorphic and igneous intrusive (magmatic) rocks. The metamorphic rocks are mainly migmatites, gneisses, leptynites, amphibolites, micaschists, cipolins, quartzites. The igneous rocks are mainly granites and basalts. 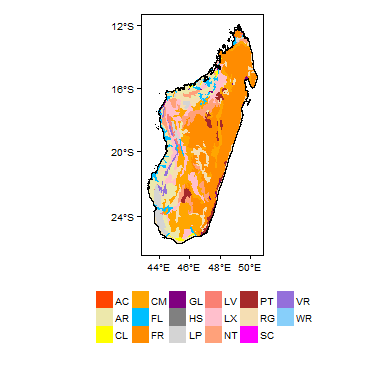 This section provides a summary of the hydrogeology of the main aquifers in Madagascar. The hydrogeology map below is an overview of aquifer type and productivity of the main aquifers, at a scale of 1:5,000,000 (see the Hydrogeology map resource page for more details). A higher resolution hydrogeological map of Madagascar is available as part of the SADC hydrogeological map, at a scale of 1:2,500,000. It is available to view through the SADC Groundwater Information Portal. More information on the map is in the SADC Hydrogeological Map and Atlas Brochure (2010). More detailed information on the hydrogeology of Madagascar can be found in the following reports: UN (1989) and Rakotondrainibe (2006). The aquifers of Madagascar can be classified into different groups or zones. For example, Rakotondrainibe (2006) classifies 8 hydrogeological zones across the country, based on geology, rainfall (and therefore recharge to the aquifers) and surface hydrology. In this Atlas, the main aquifers in Madagascar are classified according to their hydrogeological environment: the geology and the nature of groundwater flow. For example: Precambrian basement aquifers; or Consolidated sedimentary aquifers that are dominated by fracture flow; or Unconsolidated sedimentary aquifers. The following table is largely based on information from Rakotondrainibe (2006) and UN (1989). Alluvium; Sand dunes (ancient to recent); Beach sand. Quaternary and Tertiary (Neogene) Western; Diego-Suarez; Côte-Est Variable: Low-Moderate to Very High Alluvium forms a local but often high yielding aquifer in many river valleys, both in the Highlands Precambrian zone and in the sedimentary basins. Alluvium overlies the older rocks, and is typically up to 25 m thick. Borehole yields of 10 to 30 l/sec have been recorded – e.g. in the Ampotaka-Menarandra and Ademaka areas. However, many lower yields of between < 1 and 10 l/s are also recorded. There are records of permeability values of between 40 and 450 m/day and transmissivity values of between 40 and over 2000 m2/day (UN 1988). Aeolian sand dunes, sometimes partially consolidated by calcareous cement, form an aquifer that can sometimes support small borehole yields, e.g. between 0.01 and 0.3 l/s, or up to 2.5 l/s (UN 1988). Beach sand formations, up to 30 m thick, have been recorded as supporting borehole yields of 0.5 to 6 l/s, with a permeability value of 70 m/day and transmissivity values of 50 to 430 m2/day (UN 1988). The water can contain high levels of mineralisation, particularly in Neogene aquifers – including NaCl and KCl. High iron concentrations are common in alluvial aquifers. Overpumping from coastal aquifers can cause saline intrusion. Tertiary (Eocene) Western; Diego-Suarez High to Very High Eocene limestones can form highly productive aquifers. Some of the limestones are karstic, including in the Diego-Suarez basin. Borehole yields are often tens of litres per second; permeability values of 130 to 860 m/day, and transmissivity values of 725 to 6000 m2/day, such as in Majunga town, or in parts of the Morondava basin (in the Western basin) (UN 1988). Eocene sandstones in the Morondava (Western) basin can also form highly productive aquifers, with recorded borehole yields of 4 to 20 l/s, sometimes artesian. The groundwater is usually of Ca-Mg type. Various sandstone formations. Cretaceous Western; Diego-Suarez; Côte-Est High to Very High In the Western Basin, Upper Cretaceous sandstones in the Majunga basin recorded a very high yield of 35 l/s and artesian water levels from a 128 m deep borehole. A 165 m deep borehole in the Morondava basin recorded a permeability of 40 m/day and a transmissivity of 1500 m2/day (UN 1988). Middle Cretaceous sandstones in the Majunga and Morondava basins (Western Basin) have recorded borehole yields of 4 to 67 l/s, but usually between 14 and 23 l/s. These boreholes were between 22 and 500 m deep and many were artesian. In the Toliary area of the Western Basin, Cretaceous aquifers of mixed sandstone, limestone and basalt are tapped by boreholes between 50 and 150 m deep, with specific capacity values between 1 and 14 l/sec/m (Rakotondraibe 2006). In the Côte-Est Basin, Cretaceous sandstones can form confined aquifers, tapped by boreholes up to 40 m deep, with specific capacity values of 0.18 l/sec/m (Rakotondraibe 2006). High iron concentrations are common. Middle and Upper Jurassic carbonate and sandstone aquifers Western; Diego-Suarez Low-Moderate to High Can be unconfined or confined, sometimes artesian. Some of the Middle Jurassic carbonate aquifers are karstic. Where they are best known, in the Toliary area (Western Basin), boreholes are typically between 50 and 150 m deep, with recorded rest water levels typically 15 to 20 m below ground level, recorded yields typically around 6 l/s (Rakotondraibe 2006). Sandstone Jurassic aquifers in the Morondava area (Western Basin) typically show yields of 1 to 5 l/s (Rakotondraibe 2006). Karoo system (including Isalo). Carboniferous to Middle Jurassic Western; Diego-Suarez Low/Moderate to High Can be unconfined or confined, sometimes artesian. A 168 m deep borehole at Bezaha in the Toliary (Western) basin recorded a very large yield of 208 l/s and artesian water levels. However, more normally the aquifer may be less productive. A 120 m deep borehole at Antsohihy in the Majunga basin recorded a very small yield of 0.19 l/s (UN 1988). 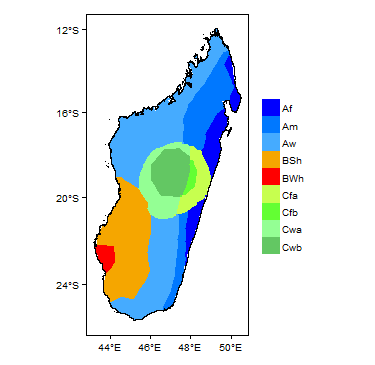 More typical borehole yields may be around 0.5 l/s in the Morondava and Mahajanga (Western Basin) and Antsiranana (Diego-Suarez Basin) areas, with yields of 6 l/s recorded in the Toliary area (Western Basin) (Rakotondrainibe 2006). Relatively low levels of mineralisation. Basalt. Tertiary-Quaternary Diego-Suarez; Highlands Moderate to High Basalts in the Antsiranana area in the north form fractured aquifers, usually unconfined. Borehole yields are likely to depend on the local distribution of fractures, but maximum borehole yields are recorded of 7 l/s (Rakotondrainibe 2006), and the basalts can support very large springs. Basalts in the Highlands province can show intergranular flow. Available evidence suggests they're usually unconfined, with shallow depth to groundwater (2-3 m), a typical aquifer thickness less than 20 m, and estimated specific capacity values of 2 to 5 l/sec/m (Rakotondrainibe 2006). Groundwater quality is typically low in mineralisation, but occasionally can be brackish to salty. Basalt. Cretaceous Western, South, Côte-Est Low to Moderate Little is known of the groundwater potential of the Cretaceous volcanic rocks, particularly because they crop out only in remote, relatively unpopulated regions. Where they have been drilled, some have proved to be unfractured and effectively impermeable (e.g. on the Radama islands and in the Boeny region in the northwest); but some have proved to be fractured and relatively productive (e.g. in the central west region). A summary of groundwater quality in all the main aquifers in Madagascar can be found in this fact sheet BGS (2002). There is little information on the pollution status of Madagascar’s groundwaters, but surface water is noted to be polluted in places, with raw sewage and other organic wastes (BGS 2002). Some shallow groundwater has high nitrate concentrations, but nitrate concentrations are likely to be low in deep aquifers, especially where there are artesian conditions. Groundwater supports much of the rural population, including from shallow boreholes or wells in altered/weathered basement aquifers and alluvial aquifers in the high plateaux, and alluvial or sand aquifers in the coastal regions. Small scale irrigation of rice fields is done in alluvial valleys between the hills in the high plateaus. Agricultural use of groundwater includes for cattle farming in the Majunga, Morondava and Tulear regions. In the semi-arid region in the far south, groundwater is often the only available water resource for domestic and livestock use. Groundwater also supplies many towns and industries. In the 1980s, the study and evaluation of groundwater was the responsibility of the Hydrogeology Division (Energy Service, Department of Mines and Energy, Ministry of Industry and Trade). A review of water point data in 2009 reported that more than 3,000 water boreholes across Madagascar were recorded in a database. Geological logs for these boreholes are not available. Information on particular groundwater projects in Madagascar, including links to project results and outputs, can be found on the Madagascar Groundwater Projects page. The following references provide more information on the geology and hydrogeology of Madagascar. SADC Groundwater Information Portal hosted by IGRAC. BRGM. 1968. Etude des ressources aquifers souterraines a Madagascar. Report 69-RME-004 par BRGM et Organisation des Nations Unies. Davies J. 2009. 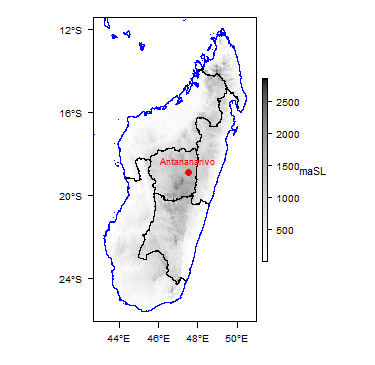 Hydrogeological mapping of north-central Madagascar using limited data. Groundwater conference, Cape Town, South Africa, 16-18 Nov 2009. Rakotondrainibe J H. 2006. Synthese de la geologie et de l’hydrogeologie de Madagascar. United Nations. 1989. Groundwater in Eastern, Central and Southern Africa: Madagascar. United Nations Department of Technical Cooperation for Development. This page was last modified on 18 February 2019, at 17:29.